Obituary for Bishop Louis McDowell, Sr. | Genesis Funeral Services & Chapel Inc.
Shelby - Bishop Louis McDowell, Sr. transitioned this life September 2, 2018. He was born on March 7, 1940 in Rutherford County, NC to the late Edgar McDowell and Caroline Lynch. He was born again on December 15, 1972 at Christ Temple Apostolic Faith Church in Dayton, OH under the ministry of the late Bishop Fred Majors. In 1977, He moved to Forest City, NC and founded the Christ Temple Apostolic Faith Church along with the Voice of Faith Radio Ministry and in the 80's The Voice of faith Television Ministry. In 1989, He expanded the ministry to 341 Hudson St.; there he established the Voice of Faith Bible College. He ministered throughout the United States, Haiti, Africa and Germany. He touched the lives of many people. His ministry extended from December 15, 1972 to September 2, 2018 ( 46 yrs). Bishop McDowell is preceded in death in addition to his parents; two sisters, Johnnie Mae McDowell and Cathleen Fox; one niece, Deidre Lynn Magee and two nephews, Robert McDowell, Jr. and Robert L. Petty. 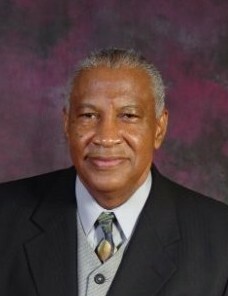 Bishop McDowell is survived by his wife, Dr. Bertha McDowell and his four children, Bridget Kelly, Marilyn Poston ( Paul), Louis McDowell, Jr.( Christal) and Mark J. McDowell, 14 grandchildren, and 14 great-grandchildren, his sisters, Josephine Mills, Shirley McGee, Alise Dodds, Mary Smith, Jackie Blanton, Betty Thompson, Pam (Billy) Lawrence and Sharon Blanton; five brothers, Lester (Regina) McDowell, Robert (Phyllis) McDowell, William McDowell and Dexter (Shanda) Blanton and a host of nieces, nephews, great-nieces, great-nephews, cousins and friends. He has numerous sons and daughters in the gospel all over the United States. Funeral: Saturday, September 8, 2018 at 4:30pm at Changers Church ( 341 Hudson Street, Shelby, NC) . The family will receive friends 1hr prior to the service.